I love warm, comforting polenta, but I don’t like making it the traditional way. I don’t know about you, but I have better things to do than whisk the lava-like mixture constantly for 15 minutes or more. So I’ve devised an easy cheater method, which involves the oven and only an occasional stir. Preheat the oven to 425ºF. Heat a small, heavy sauté pan over medium-low heat until hot but not smoking. Add the pepperoni and fry, tossing frequently, for 6 to 8 minutes, or until rendered. Drain on paper towels. Combine the polenta, water, chile flakes, and a generous pinch of pepper in a small pot. Heat to a bare simmer, stirring occasionally. Transfer to the oven and bake for about half an hour, or until the polenta is tender and creamy. Stir in the Parmegiano and pepperoni and season to taste with salt. Divide among individual plates and serve immediately. Serves 4. Stir in a splash of cream or a pat of butter for an even creamier polenta. 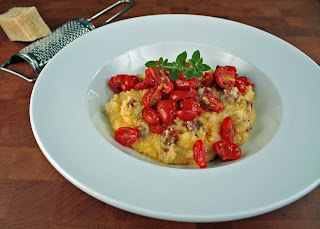 This polenta just begs to be topped with Roasted Grape Tomatoes. Transform it into an all-purpose, basic polenta by omitting the pepperoni. This recipe doesn’t take well to being doubled. I just made the simplest possible variation of this, just polenta, water, salt and pepper. Rather than heating the polenta in a saucepan then then pouring into the oven pan, I simply poured boiling water over it directly into an 8x8 pan. The other variant was to cook it longer, which took it from creamy to firm, more or less like what you get when you do leftover polenta.